A global workforce presents both opportunities and challenges to companies and countries alike. Around the world, millions of people work in factories producing high-end goods consumed in the West and Europe. As Leslie Chang begins her talk for TedTalks, she mentions that in the U.S., as beneficiaries of globalization, we often feel we exploit these workers as victims who have been treated unjustly. We assume that Chinese factories are oppressive and that is our fault as Western consumers who desire cheap goods. Chang contends that these thoughts are both inaccurate as well as disrespectful; what is the ego involved to imagine that we have the power to drive millions of people on the other side of the world to suffer in their work? Her thesis points out that Chinese workers choose to leave their homes in order to earn money, learn new skills, and see the world. Her talk gives a voice to the workers themselves and we learn from them what they value and dream of in their own lives. 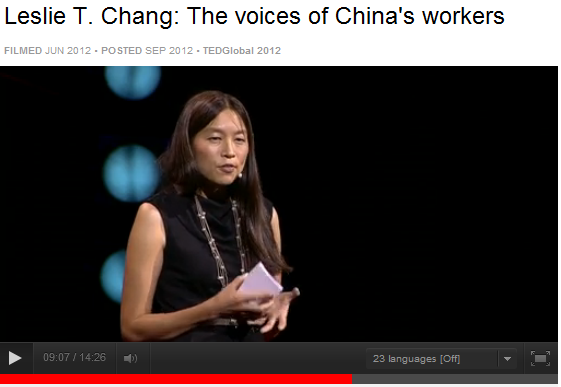 In this moving and timely talk, Chang examines the lives of workers in China, interviewing them and taking a new look at what globalization offers to workers in emerging countries. As we might assume, there is both great good, as well as some harm, that has come from the outsourcing of manufacturing to China. Listen to Chan’s talk and decide on the issue for yourself. Begin with a discussion about globalization. Before showing the video, ask students what their thoughts are about the emerging countries’ manufacturing operations? What are the factors that have led to manufacturing in China? What are the implications of this? Positive aspects? Negative aspects? What are the responsibilities of corporations when outsourcing work to emerging countries such as China? Discuss aspects of Apple’s and Nike’s oversees manufacturing. After viewing the video, what are students’ thoughts now about emerging countries’ manufacturing?